Jordan Lee Pickford popularly known as Jordan Pickford is English professional footballer, born on 7th March 1994 in Washington, England. He plays as a goalkeeper for his national side, England, and club side, Everton. According to football pundits, Pickford has the potential to become the number one goalkeeper for England in the coming years. At the age of eight, Pickford joined Sunderland academy, 'Academy of Light', and rose through the ranks of youth teams to sign for the club on a two-year scholarship in 2010. After representing Under-16 England side, Pickford guided England to the quarter-final and semi-final of the 2011 FIFA Under-17 World Cup and European Under-17 Championship respectively. In the World Cup, he saved two penalties in the shoot-out against Argentina Under-17 team in the pre-quarter-final. He went to Darlington on loan in January 2012 which was followed by a loan stint in Alfreton in February 2013. He played for Burton Albion, Carlisle United, Bradford City, Preston North End on loan till December 2015. A month later, the talented custodian earned his maiden senior team appearance in the FA Cup clash against Arsenal. Under the manager David Moyes, Pickford cemented his spot in the first eleven. In Spite of Sunderland's relegation, he was primarily short-listed for the PFA Young Player of the Year in 2016-17. The youngster led England to the semi-final of the 2017 European Under-21 Championship. In the semi-final against Germany, he stopped a penalty but his teammate failed to capitalise on it. The custodian also played at the Under-18, Under-19 and Under-20 level for the English national team. Pickford was called up in the national side for the World Cup qualifiers in October 2016. But he had to spend five matches on the bench before finally getting his maiden international cap in an international friendly against Germany in November 2017. He managed to keep a clean sheet. 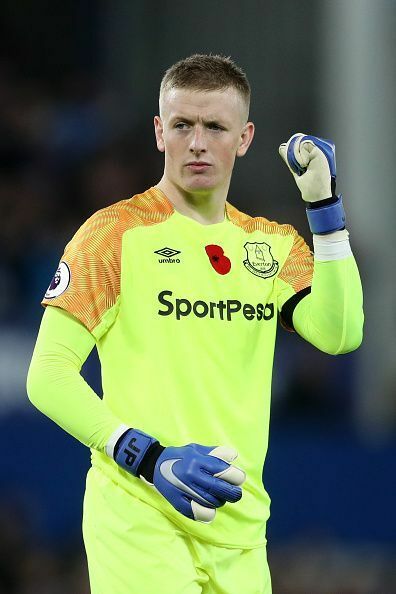 Pickford’s ability to maintain his authority within the 18-yard box and consistency escalates him as one of the top goalkeepers in English Premier League (EPL). He kept 11 clean sheets in 41 matches in the current season for Everton. Pickford started his career at Sunderland and appeared 36 times for the Black Cats in all competitions. In July 2017, the 23-year-old custodian became the most expensive British goalkeeper in history in June 2017 when he penned a five-year contract with Everton for a record fee of 30 million Euros. Is Jordan Pickford an ideal replacement for David de Gea?